The Thrustmaster T.Assault is taking aim at the Rainbow Six Siege crowd with a headset emblazoned with the game’s iconic “6” logo. This latest entry in the company’s line of licensed “T” headsets sits atop their product stack, entering the market at the competitive $99.99 (See it on Amazon). As an analog headset, they’re versatile and made to be used with any gaming platform that supports a 3.5mm jack. They feature stereo sound, a detachable mic, cross-platform compatibility, and a militaristic look. They’re going up against heavyweights such as the HyperX Cloud 2, Cooler Master MH752, the Razer Kraken TE, and other midrange, wired stereo headsets. If you’re familiar with the Thrustmaster brand, it’s probably from their line of racing wheels and flight-sim accessories. It’s fitting, then, that the T.Assault has the iconic deep-oval ear-cup design worn by race car pit teams and fighter pilots. 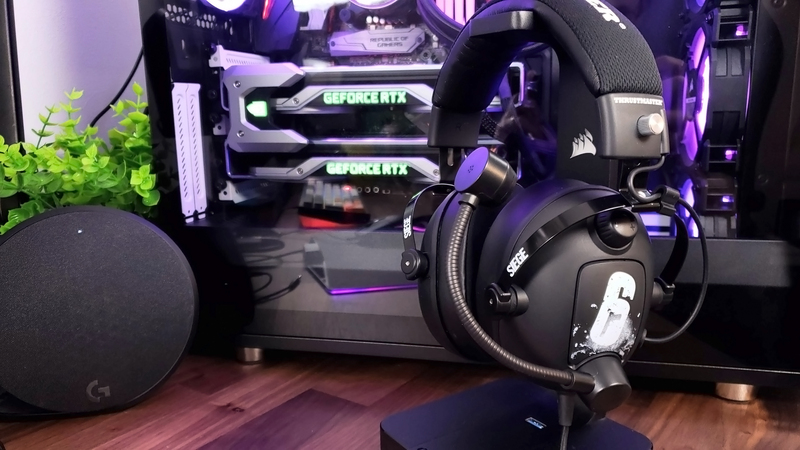 They stand apart from other gaming headsets thanks to their thicker cup design and plush memory foam ear cushions, and are definitely bulkier and more utilitarian compared to most gaming headsets on the market. I couldn’t see wearing these out of the house even with mic detached for fear of looking silly, so I wouldn’t consider wearing them while gaming on my Switch on the bus.